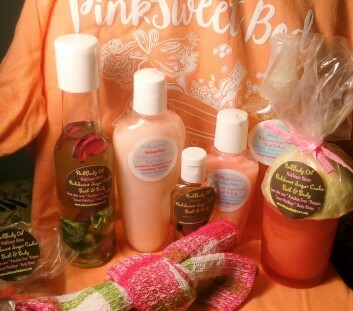 Pink Sweet Sugar Cookie Bath and Body, was created out of our Creative Director, Inga A. Rheams Love Affair with the color Pink, Sweets and Spas.. It all began with our love of smells, oils and the need to give ourselves another body and skin care choice. We all have sensitive skin and love the warmth of heat and hot water so making a way for additional moisture, with natural and organic skin care is our reason for PinkSweet body care. Sweet Body Kisses they deserve. had begun making her own body oil as a teenager. years and as a child grew to love every shade of pink! PinkSalt Soak, PinkBaked Mocha, PinkCrush, PinkShea, PinkLavender Joy, PinkOcean, PinkSpecialty Soap which all make up PinkSweet Body Therapy.